Flipcharts in wood - designed and produced by roomours. Modern work processes require flexible and reliable tools that dynamically and productively promote creative exchange. roomours flip charts are the ideal communication tools - for team meetings, ideations, or presentations. Thanks to their smart design and the use of high-quality materials, the flip charts blend in perfectly in different environments and are reliable helpers, also before your employees, customers, and business partners. Our flipcharts are designed to support communicative processes and encourage creative exchange in the office or in class. 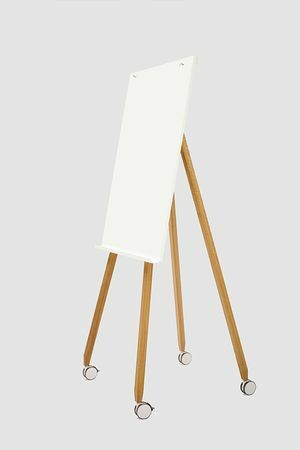 The combination of wood for the legs and metal for the writing board makes the flipcharts from roomours perfect for a variety of environments. Clarity of form and function in a timeless design language. 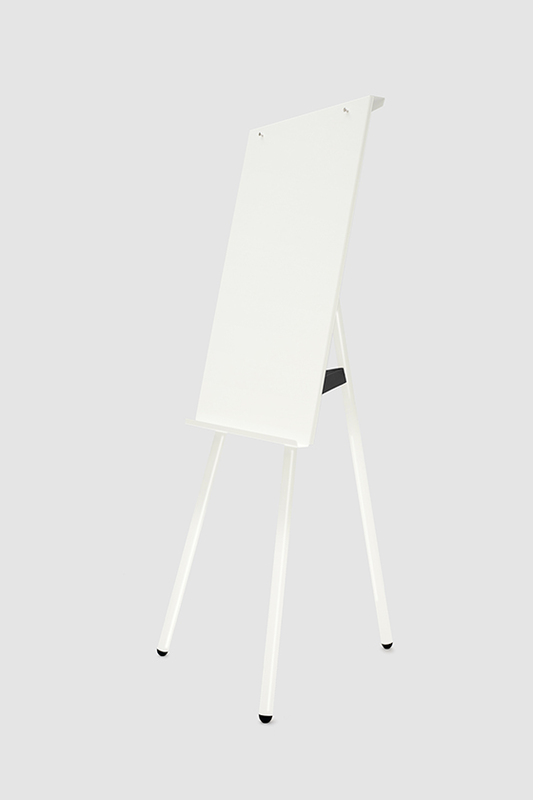 A flipchart in black, white, grey, yellow or green? On wheels or rather stationary?Easy to use - functional with an ergonomic design. Our goal is to make sure users of our flip charts have the best possible solution. The tear bar holds the pads securely on the flip chart, even when turning pages or tearing off sheets from the pad. 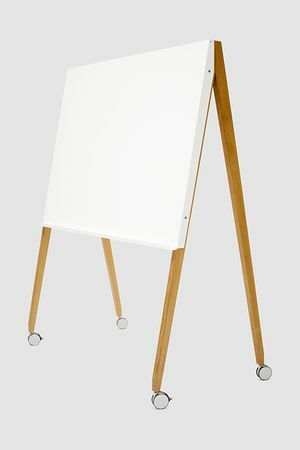 All white boards of our flip charts can also be used as whiteboards, i.e. with board markers. They have a dry erase surface that can be wiped off using a microfiber cloth. Our colorful flip charts add more glamour into the game whereas the magnetic surface make them even more versatile. 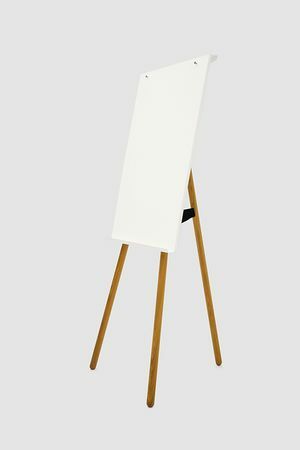 Charter - the classic flip chart on a sturdy tripod, which blends in perfectly into small rooms, or Freewheelin’ - the lightweight, portable, and dynamic flip chart on four wheels. 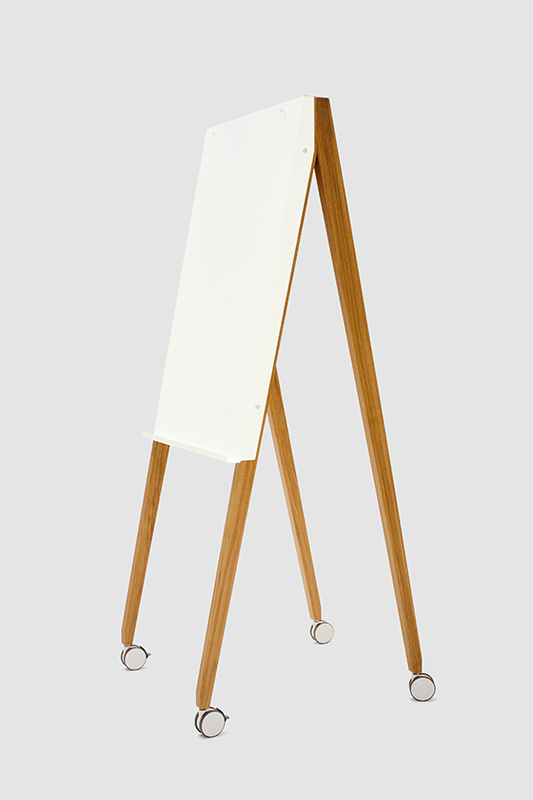 Foldable - designed for temporary use and high formal requirements. When folded, this flip chart only has a depth of 10 cm. Charter on Tour for use with one flip-chart pad and Jack White on Tour for attachment of one or two pads arranged side by side. In the same sturdy design but with different widths to make these flip charts the ideal duo for all scenarios that require active contribution and a lot of working space. Perfect for team projects, workshops or informal meetings in this room or that, Flipchart Foldable is amazingly portable and practical. It can be folded flat and leaned against a wall ready-to-use. 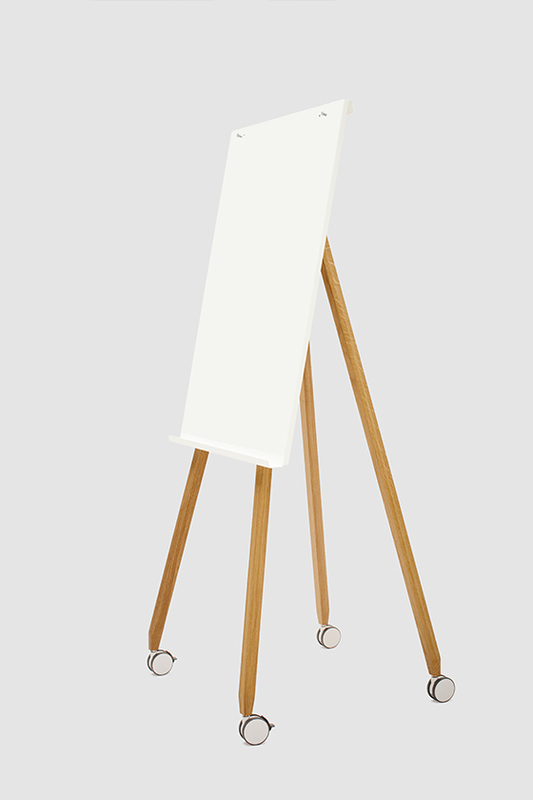 Flipchart on a tripod in oiled oak with foldable middle leg. 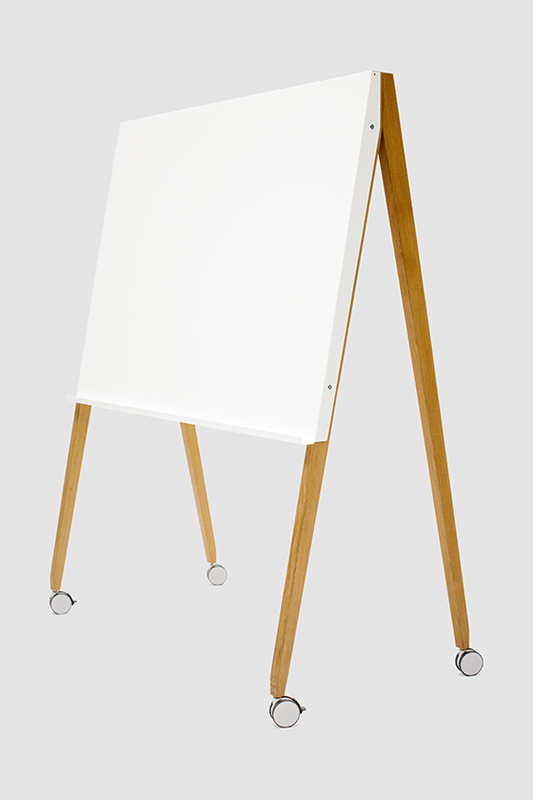 The powder-coated, magnetic metal board is available in white, black or any RAL colour on request. Accepts all standard pads. 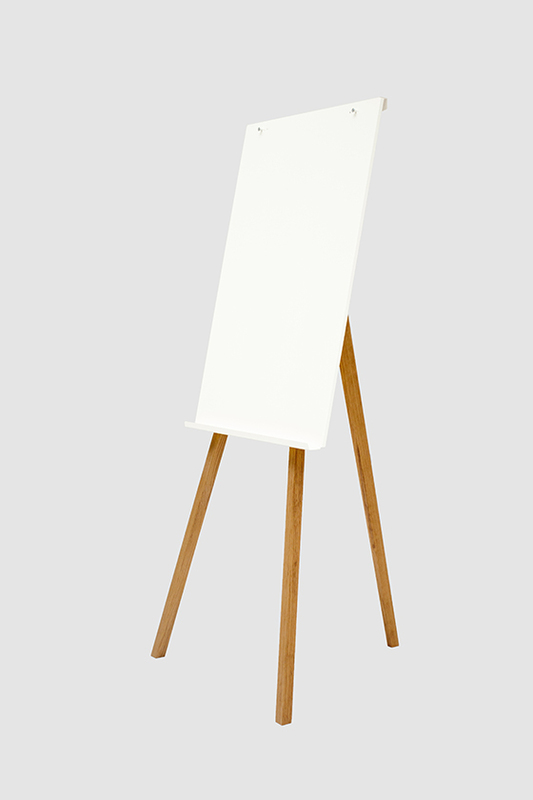 Special features: dry-wipe white board suitable for all board markers. A custom CI color or the right tone for your setup? We are happy to offer the metallic surface in the color of your choice, be it RAL, NCS, or Pantone tones. The oak surface can also be glazed or varnished in the desired tones for a unique touch. You are also welcome to send us a sample and we will be happy to orient ourselves to your color scheme. We gladly coordinate the delivery times with you but always require some time, particularly with processing of wood surface and with custom color specifications.